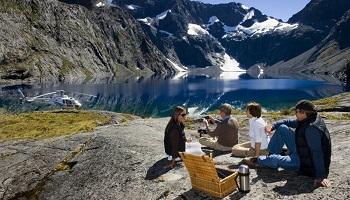 Matching stunning surrounds, fantastic outdoor pursuits, comfort and hospitality, with cuisine based on the freshest local produce and finest regional wines the "Inspiring New Zealand - a route less traveled" itinerary will take you to areas in New Zealand not normally included on self-drive itineraries. 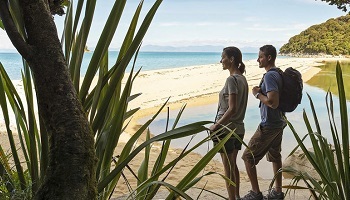 From the untouched Great Barrier Island, the Farm at Cape Kidnappers in Hawkes Bay to the capital city of Wellington, stunning scenery of Abel Tasman National Park and on to the adventure capital of New Zealand - Queenstown - your itinerary will provide incredible diversity across the North & South Islands. 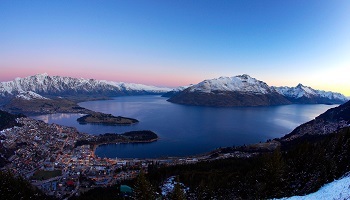 Enjoy unique lodging experiences all offering ultimate comfort & genuine Kiwi hospitality. 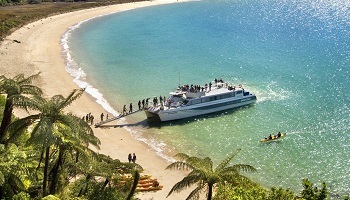 Arrive in Auckland where you will be met and transferred to the domestic terminal to connect with your 30 minute light aircraft flight to Great Barrier Island– one of the North Island’s best kept wilderness secrets. ACCOMMODATION - romantic and tranquil lodge where you will be soothed by the rustle of trees and the music of birdsong.The luxury Lodge is a unique building of straw-bale construction and has been created in harmony with the earth's scarce resources. The thickness and subtle curves of the adobe-finished walls have a timeless character and beauty creating an overall feeling of comfort. Ocean View Suites at Earthsong Lodge all feature private sunny courtyards. Separated from the main lodge and connected by a cobblestone path, each graciously appointed guest suite has an entry lobby, an adjoining en-suite, and large bedroom with king-size bed or twin. French doors open onto a private veranda, providing you a quiet haven with panoramic views of the Hauraki Gulf, pristine Tryphena beaches and the Earthsong olive grove. Great Barrier Island's rugged landscape, breathtaking views and unspoiled white sandy beaches offer a world that can soothe the spirit and challenge the adventurous. Much of Great Barrier Island, located in Auckland's Hauraki Gulf Marine Park, is a treasured sanctuary for many native plants and wildlife species. The unique location of Earthsong Lodge enables guests interested in ecology to easily explore the habitat of some of New Zealand's rarest and endangered wildlife. 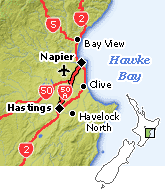 On arrival into Napier collect a rental car and self drive to the farm at Cape Kidnappers. ACCOMMODATION - The Farm at Cape Kidnappers - one of the world’s extraordinary top luxury destinations, set on a 6,000 acre sheep and cattle farm with breathtaking views over the Pacific Ocean in the Hawke’s Bay wine region. With twenty two ultra-comfortable and spacious cottage suites and a four bedroom Owner’s Cottage, and a spectacular Tom Doak designed golf course, all with spectacular views of the Pacific Ocean. Includes full breakfast, lunch, daily pre dinner drinks and hors d’oeuvres, gourmet dinner, complimentary mini-bar (excluding liquor and wines) and use of lodge facilities. Hastings was devastated by a huge earthquake in 1931. As a result, the city has a great deal of remarkable Art Deco and Spanish Mission-style architecture. Fabulous parks and delicious ice cream are two other reasons to visit Hastings. In the apple and pear season, there’s no better place to be – Hastings is New Zealand’s leading pipfruit region. On your way south you'll drive through Waipukurau and Waipawa—both have historic buildings to view. In Dannevirke, a town originally settled by Scandinavians, you can inspect locally made knitwear. Woodville is a place for antique browsing. Before you reach Masterton, you'll encounter the legendary town of Eketahuna (in kiwi slang Eketahuna is the archetypal hick town). The wildlife sanctuary at Mt Bruce is an essential stop. Every year in March, Masterton hosts the international Golden Shears competition. Sheep shearing in the Wairarapa is both a sport and an art form. Enjoy the clean, green scenery as you drive north through the friendly townships of the Wairarapa. In Featherston you’ll find an interesting locomotive museum. Greytown has many beautiful examples of Victorian architecture and a quaint museum – take yourself on a self-guided walk. Carterton is a good place to shop for paua shell souvenirs – it’s also a place to enjoy daffodils in the spring. In recent years, Martinborough has become the gourmet capital of the lower North Island. It is home to over 25 boutique vineyards, several fabulous restaurants and a number of upmarket bed and breakfast establishments. From the charming town square, you can walk to most of the local attractions. ACCOMMODATION - At The Martinborough Hotel choose a room to suit your mood. Indulge in the elegant surroundings of one of our nine Verandah Rooms, at the top of the grand flight of stairs in the original 1882 building. Or take a wander through the pretty courtyard just beyond the lobby and enjoy the tranquillity of seven spacious Garden Rooms finished in a restful simple country style. Our Garden Suite is spacious, up a private flight of stairs and overlooks our garden on a private verandah. The Suite inter-connects with a Garden room, perfect for families or friends. Continue south to Wellington taking the spectacular coastal drive via Cape Palliser(Cape Palliser Seal Colony - the largest breeding ground for fur seals in the North Island) . The contemporary Museum Hotel provides your accommodation for this evening. The drive to Wellington wind throughs the picturesque Hutt Valley before climbing over the Rimutaka Range and descending into the tranquility of the Wairarapa region. 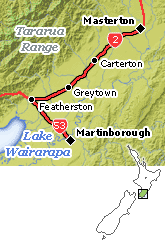 If you don’t want to drive, a scenic train trip runs from Wellington to Featherston. Wellington is compact, cultured and full of character. Nestled between the harbour and the hills, the downtown area is ideal for explorations on foot. Enjoy cafes, restaurants, museums and all kinds of shops. Dance, theatre and musical performances are a Wellington specialty. As New Zealand’s capital, this city is rich in political history. 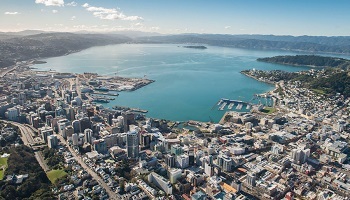 This is an unforgettable journey around the city's dramatic highlights, during which clients will travel around the earthquake-scarred South Coast to see the site of the Wahine ferry disaster and the distant ranges of the South Island, overlooked by coastal houses perched on the steep, rocky hills. 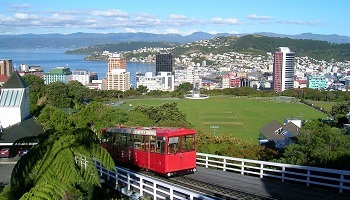 Enjoy views of the harbour from the top of Mount Victoria and ride the steep cable car up to an incredible, far-reaching panorama. Visit the magnificent Parliament buildings and the famous Beehive and see the gorgeous, timber-built Old St Paul's Cathedral before visiting the national museum of Te Papa to experience the extraordinary mix of Maori and European history, amid the nation's natural and cultural treasures. Take an in-depth journey to discover Te Papa's taonga (Maori cultural treasures) and hear their stories for insights into Maori cultures. From historic, artistic and contemporary perspectives, this tour will enrich your understanding of what makes New Zealand's Maori culture unique. Tour concludes approximately 1 hour after commencement. 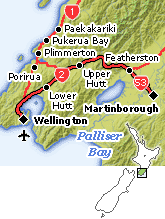 The passage across Cook Strait and through the Marlborough Sounds is one of the most scenic ferry trips in the world. The fast ferry makes the trip in just over 2 hours, the cruise-style ferry takes 3 hours. Both types of vessel can transport vehicles. Highlights along the way include the Red Rocks seal colony, Tory Channel, Cook’s Lookout and the beautiful coves of the sounds. The drive to Nelson first takes you to the town of Havelock, which is known as the Green Shell Mussel Capital of the World. Nearby Canvastown is a place to explore old gold mining fields – thousands tried to get rich here in the 1860s. At Pelorus Bridge Scenic Reserve you can enjoy a bush walk or a swim, depending on the time of the year. And if you’d like a glimpse of local life in 1890, Rai Valley has a beautifully preserved cottage museum. 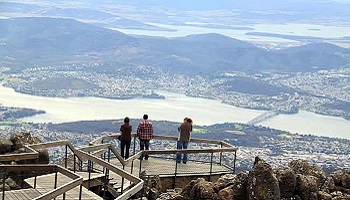 The city of Nelson is home to a fascinating community of beach, bush and art lovers. 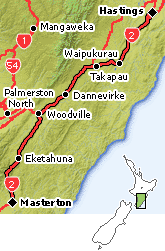 The road to Motueka hugs the coast, which makes it easy to browse beaches as you go. 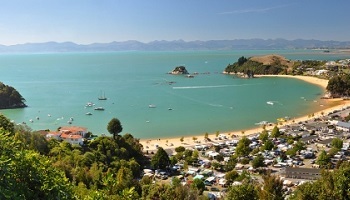 The Waimea Inlet and the villages of Mapua and Ruby Bay are particularly irresistible. Art and pottery studios, vineyards and excellent cafes are other local distractions. Because it’s so close to the Abel Tasman National Park and the Kahurangi National Park, Motueka is an ideal place to plan and prepare for hiking adventures. ACCOMMODATION - The Resurgence, which is located on the doorstep of Abel Tasman and Kahurangi National Parks, this Nelson accommodation is nestled in 50 acres of bush close to the source of the Riwaka river. Let the birds come to you as you have a leisurely breakfast on the verandah then explore the bush tracks in our 50 acres of grounds and amble down to the magical source of the Riwaka River with a picnic. In the afternoon, take a dip in the pool, pamper yourself with a massage or relax in a hammock and enjoy a cold beer. Your hosts, Clare and Peter, are well travelled and passionate about the New Zealand outdoors. They offer friendly advice and will help you plan and book tomorrow's activities - from kayaking, walks and horse treks to art and wine trails. To round off a perfect day, soak in the spa under the stars. Ideal for couple. The Deluxe and Superior Lodge Rooms are for those clients wanting the full hosted Boutique Lodge experience. These ensuite rooms are upstairs in the main Lodge building and include full cooked breakfasts, aperitifs at sunset and 4-course table d'hote dinner. Morning 'Split Apple Paddle' guided half day kayak trip, explore the spectacular Kaiteriteri coastline. Stop on a golden sand beach for a short break. In the afternoon swap the kayak for walking shoes, and cruise to the golden sands of Onetahuti, visiting the fascinating seal colony at Tonga Island on the way. Calling in at Kaiteriteri before departing for Anchorage, relax on the beach with a picnic or enjoy a one hour return walk to Te Pukatea Bay, a 1 1/2 hour return walk to Pitt Head to view the lighthouse and panoramic views, or from Anchorage walk to Cleopatra's Pool. The drive to Nelson first takes you to the town of Havelock, which is known as the Green Shell Mussel Capital of the World. Nearby Canvastown is a place to explore old gold mining fields – thousands tried to get rich here in the 1860s. At Pelorus Bridge Scenic Reserve you can enjoy a bush walk or a swim, depending on the time of the year. And if you’d like a glimpse of local life in 1890, Rai Valley has a beautifully preserved cottage museum. ACCOMMODATION - Queenstown House Boutique B&B provides views overlooking Queenstown Bay, and is conveniently located just a short walk from Queenstown's main center. Comprising of 15 rooms which include suites and guest rooms all with lake or alpine views and individually decorated with ensuite bathrooms. A deluxe breakfast menu is included in the lake view dining room or privacy of your room if preferred. Join your Milford Sound Scenic Flights crew at Queenstown Airport, Sir Henly Wigley Dr, Frankton, to commence a full day Milford Fly Cruise Fly/Dart River Safaris Combo tour. Fly from Queenstown to magnificent Milford to enjoy a launch cruise travelling the full length of Milford Sound. Return by scenic flight landing at Glenorchy to join Dart River Safaris to journey into the untouched wilderness of a World Heritage Area before coaching back to Queenstown. Tour concludes approximately 10 hours after commencement, at Queenstown Airport. A half-day heritage tour that follows the rugged and once treacherous Skippers Road. Hacked by hand into the sheer cliff sides of the Shotover River Valley. Navigate this awe-inspiring canyon and visit many historic sites such as the Skippers Suspension Bridge, township of Skippers, and the restored school house - gain a real insight into the local heritage through photos and histories of life in this tough environment. You will be transferred to Queenstown airport - board your flight to Auckland where you will connect with your international flight to the Los Angeles. Daily departures, this package is an independent itinerary with flexible departures (not a group tour), the above costs apply for travel within each date band when you depart & return within these dates, ask an Aspire Down Under consultant for a quote when your travel dates cross over the date bands. Add on airfare is available from most major airports - ask an Aspire consultant for a quote from your local airport. Package from pricing is based on double occupancy (2 people sharing a room) from Los Angeles or San Francisco for purchase by 31 December, 2017. Ask an Aspire consultant for pricing for other travel dates. Add-on fares are available from other cities. Certain blackout dates apply on the accommodation and tour value add offers - check with your Aspire consultant. Seats are limited and may not be available on every flight. Hotels are subject to availability. All prices reflect a discount for purchases made by cash/wire transfer/check, please see terms and conditions for credit card payments. There are no discounts for payment made by credit cards. Cancellation penalties and other restrictions apply. Free Fiji offer only applies when package is for 2 people, not valid for single travelers.